*If you prefer, you can see a .pdf version here (2.36 Mb). 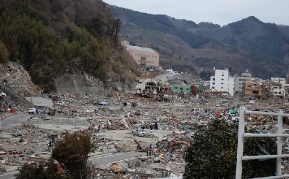 It has now been 3 months since the devastating earthquake and tsunami that hit Northern Japan. Because we live hundreds of miles away, we have been unaffected by the aftershocks, power outages, radiation scares and food shortages that he disaster left in its wake. However, this does not mean that we have not been impacted. Daily we are reminded of the great loss and suffering that has impacted millions of people in this nation, and we cannot help but to feel great compassion for those whose lives have been forever changed. At church, we have responded by collecting money and supplies to send to the effected area. Specifically we are partnering with a group in Osaka called Be One Tohoku who is organizing weekly caravans of supplies and workers to make the 12-hour drive up to the small town of Ishinomaki. Not only is this group making a practical contribution to the community through their distribution of supplies and helping to meet practical needs (like cleaning the mud from inside people's homes), but their Christian presence is also making an impact on the lives of the residents. One friend who recently returned from Ishinomaki tells a heart-warming story of a single mother and her son who lost their home in the earthquake. For the last few months, they have been getting to know the Christian relief workers serving in her town. Our friend recently received the following e-mail from the mom: "If this disaster had not happened we probably would have never met. Although I cannot say I'm happy that the earthquake happened, I no longer wish to return to the days before the disaster. If God is real, I would like to thank Him for sending you and letting us meet you all." Despite the devastation, it is clear that God is using this terrible event to draw people to Himself. Many people in Japan are realizing that God is real and that they need Him. Please pray that thousands (millions!) of people would come to know Jesus as their personal Savior, Shepherd and Friend. Please also pray for those Christians who have been working so hard in the devastated areas. The clean-up work goes very slowly, but there is still months and months of work to be done. Pray for fresh strength and renewed vision for those who are coordinating the Christian relief efforts. Finally, please pray that more and more Christians (from within Japan and from overseas) would be willing to demonstrate the love of God through their faithful service to those in need. Michael has been wanting to go up to Ishinomaki for quite some time, but the current situation at church makes it a bit difficult for him to get away. Please pray that he would be able to make it up there some time this summer. From the church side, the last few months have been a season of trying to seek and discern the will of the Lord. Our financial struggles have caused us to consider whether or not to move from our current facility into a smaller place (with cheaper rent!) After two months of seeking the Lord, the church family gathered together to share what we thought the Lord was saying to us. The unanimous consensus was that God was NOT leading us to move at this time. While we are very thankful for God's direction in this matter, we still need to consider the monthly shortfall in our budget. We know that God has a plan for the church, and that our desire is to trust in Him and follow wherever He may lead. Honestly, this season has been a bit stressful for the entire church family, but through it all, God is teaching us how to look to Him to be our Good Shepherd. Please pray that God would teach all of us how to listen to, discern and follow his voice (John 10:27). Looking ahead to the summer, we have a couple of exciting things planned. 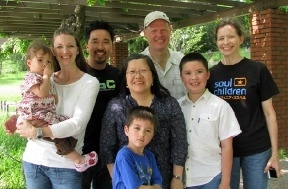 In July, we are planning to have another baptism celebration. Currently there are three people (possibly four) who are considering taking this wonderful step. Please pray that God would clearly lead and guide those involved. Also, on July 31st-August 1st, we are planning a special outreach event for children. Based on a Mexican theme, we are calling it Kid's Bible Fiesta. This will be a time of games, songs, bible lessons, crafts, drama, food and talking about Jesus. A short-term mission team from a church in California will be here at that time to lend a hand, so we are hoping for lots of youthful fun and energy. Please pray for those who are planning, but pray mostly that many non-Christian kids (and parents!) will join us on that day. May they hear about the love of Jesus and respond to His invitation to walk with Him. Chris has recently found two new opportunities for doing ministry. The first is a twice-a-month Bible study for women in our area. This is a group of women from a variety of different churches (and some who don't go to church at all) who are hungry for this type of gathering. Please pray that the women would not only grow in God's word, but that this time would also provide much needed support and encouragement to these women. Secondly, in June we started up a women's prayer meeting at church on Thursday mornings. Besides the blessing that this meeting will be on the entire church, please also pray that this would be an occasion for Chris to bless the other women who are there. One of Chris' gifting is in the area of prayer ministry. May God use Chris to build up and empower the women of the church. On a more personal note, many of you have been praying for Chris' eye. She has been suffering from uveitis since last October (first in her right eye, and then in her left.) Well, her situation is gradually improving. Please continue to pray for complete healing. Pray also that this condition would never return! Thank you. Finally, our son, Luke, is graduating from 4th grade this week. At his school, 5th grade is considered middle school, so he is moving up! We are proud of our son and all of his hard work this year. Congratulations Luke! Well, that's all for our update this time. As always, thank you for your prayers for us. 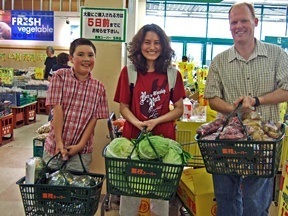 Your prayers are a vital part of our ministry in Japan.